Brutal sun and other challenges! Using gravel as ground cover. 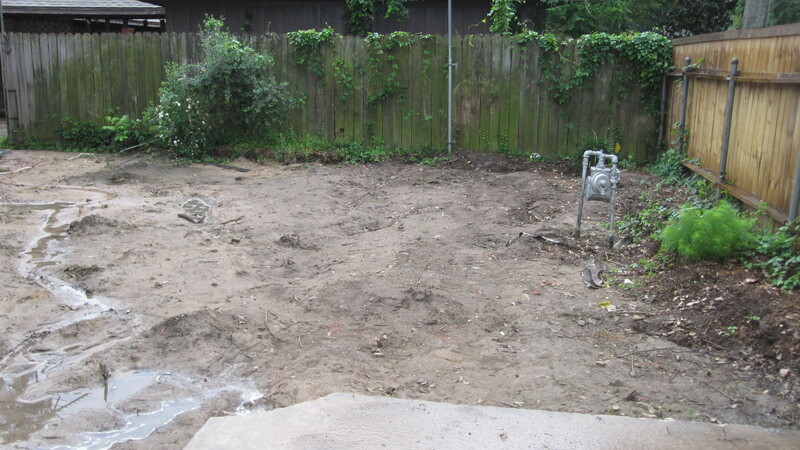 Transforming this backyard into an inviting garden was a bit of a challenge. The driveway took up half the space and the neighbor’s windows looked across the yard. The space felt hot with all the concrete and brick. The sun blazed down on it all day long. 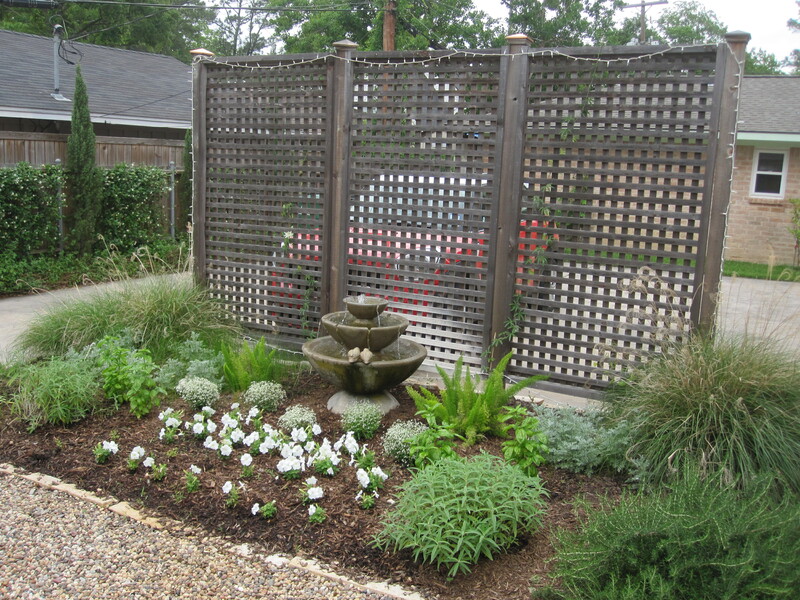 The owners desired a simple garden with charm in a soft southern style. We decided on a white garden which looks fresh and is lovely in the evening as the sun goes down. That is the most pleasant time to sit out there so it was a perfect choice. High on the list of needs was gain some privacy and more space to entertain. Additionally they wanted a place for herbs and some cut flowers. And they were on a tight budget! Before! Fall 2011, notice the cement is poured in two sections. We removed the section next to the brick. 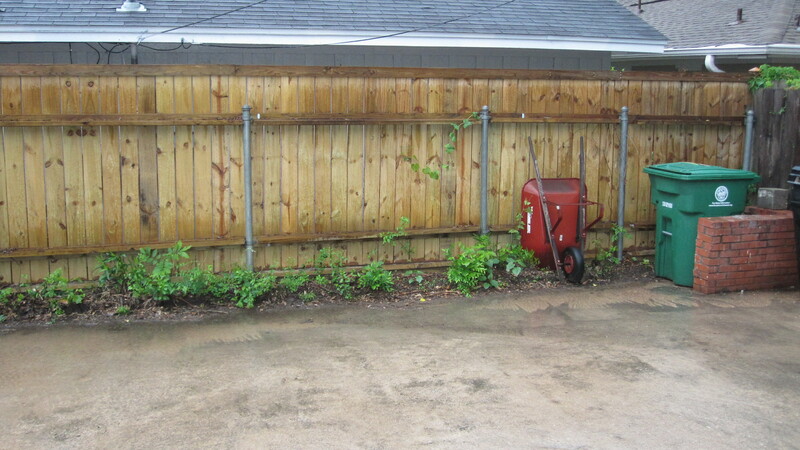 Overgrown plants along the fences and a big raised bed took up a big portion of the useable space. 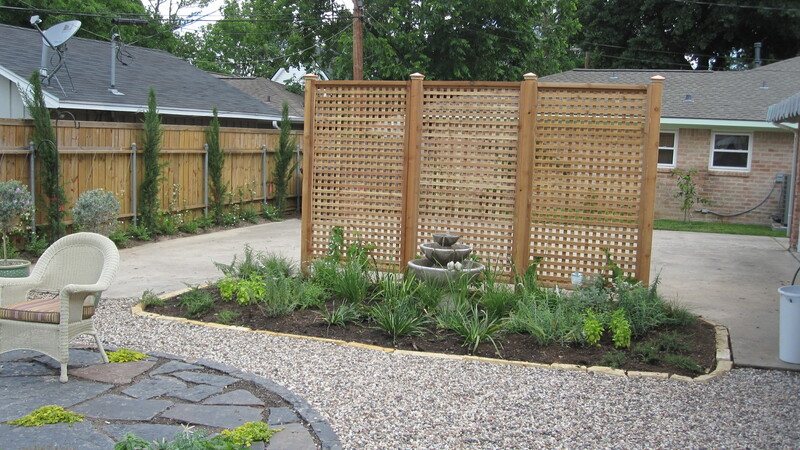 We didn’t want to add back more hardscape unless it was going to be water permeable. There are paver options but the owners were considering adding on to the house and didn’t want to pay for a solution that they might dig up later. We removed part of the cement, all the brick, and most of the old plants to start fresh. We were able to salvage a few plants and moved a few others to the side of the driveway. I wish we could have moved the gas meter too! Working with a blank slate is sometimes daunting but also freeing! One of the challenges was the metal post that were left after the neighbors put up a new fence. 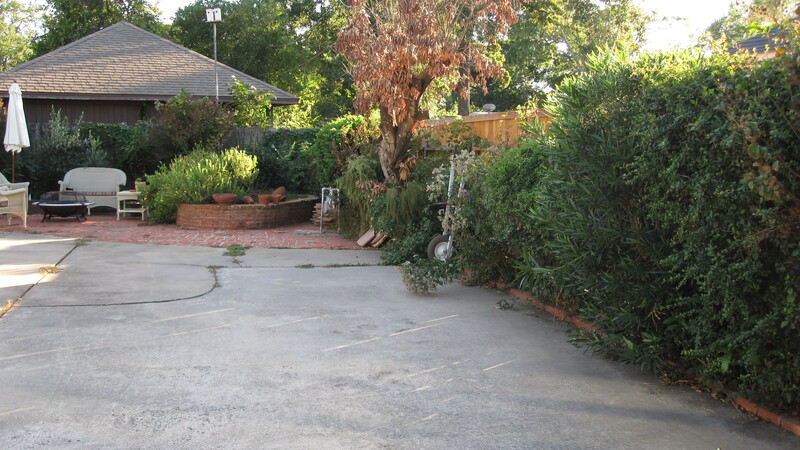 Below is the driveway side of the yard. 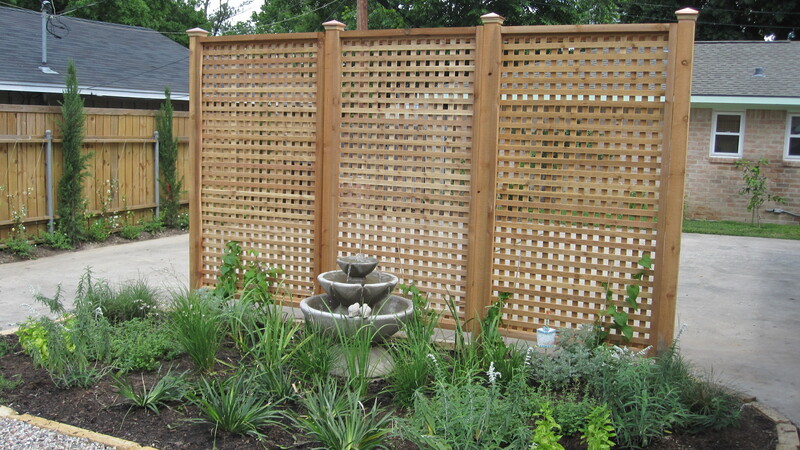 They wanted something to mask the fence but the challenge was the bed was only 18″ wide at its widest! The above photo was the following year and everything is growing in very well. We designed a bed to fit into a curve that already existed in the cement driveway area. 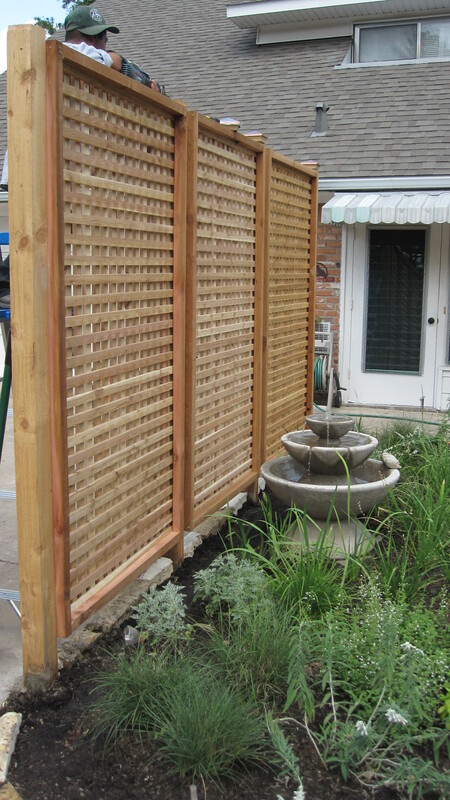 We installed a 3 panel cedar screen to obscure the view but still keep the openness of the space. The fountain makes a nice focal feature and helps you feel cooler in this hot space. We planted vines to grow up the screen and a mixture of herbs and butterfly attracting native plants. 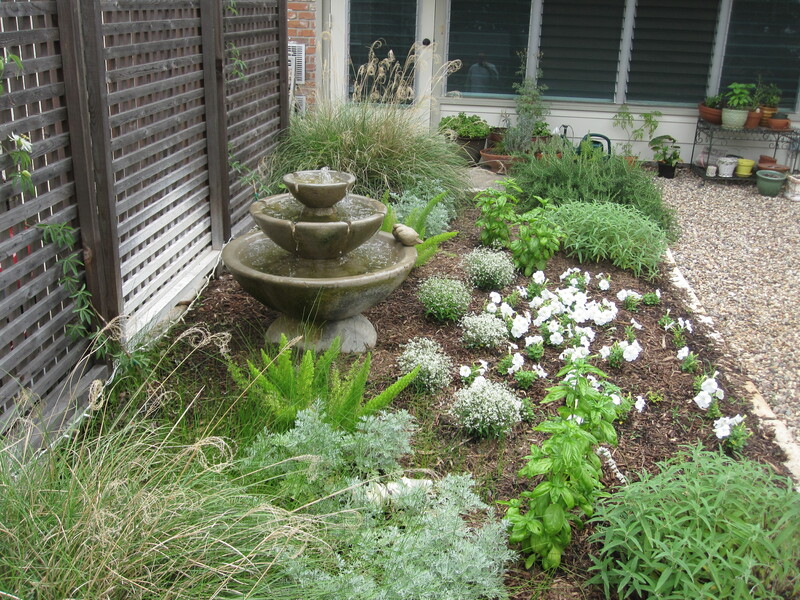 We were able to line the screen up with the back door so you walk out and see the pretty herb garden and fountain. And your gaze is directed into the entertaining area and not to the driveway. Natchez Crape myrtle with green ardisia. 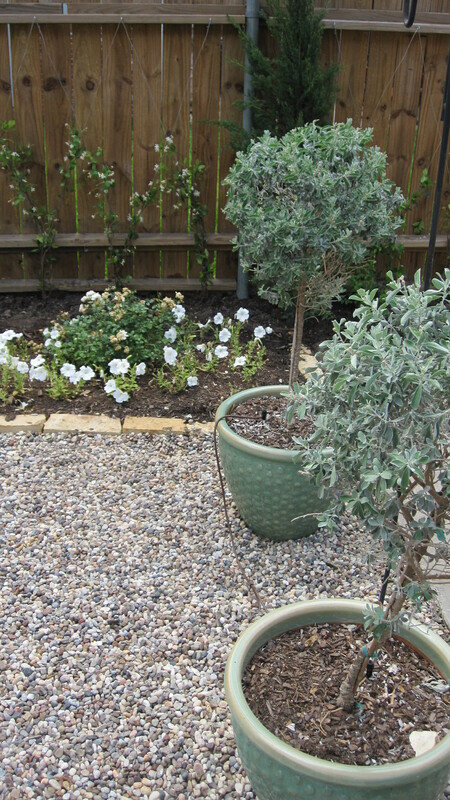 To keep with the white theme we used a Natchez crape myrtle in the southwest corner. It will take a few years but it will help shade the area from the late afternoon sun. Natchez crape myrtles are fast growers and one of the larger varieties of crape myrtles. I love the way their bark turns a cinnamon color in the spring and then peels to a smooth cream brown as it loses its leaves in the fall. If left to grow natural, and not over-pruned, it makes a nice umbrella shape with lovely long multi-trunks. I like to put string lights on mine for Christmas. It is a hybrid between the Japanese Crape Myrtle (Lagerstroemia faurei) and the common Crape Myrtle (Lagerstroemia indica). One of the first hybrids developed and released by the US National Arboretum in 1978. Natchez produces long lasting clusters of white flowers that last up to 100 days, longer than any other variety of crape myrtle. It wants to grow into a tall arching form up to 25 plus feet tall. The leaves become dark green by summer and then turn yellow and orange in the fall, especially if we have a cold snap. 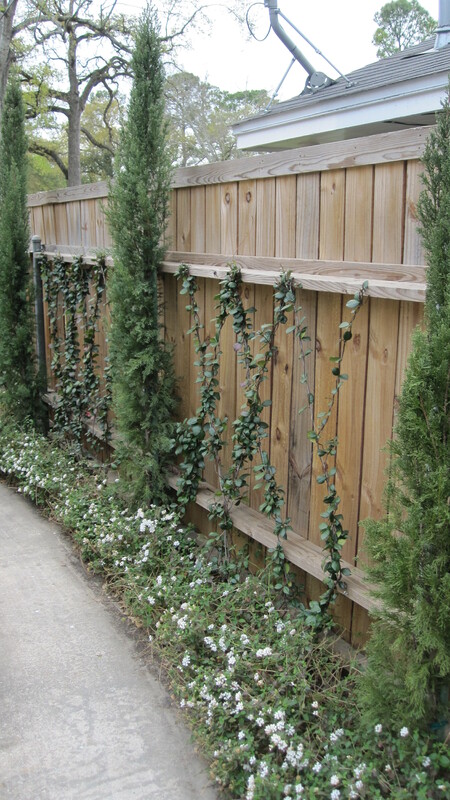 It is tolerant of many different kinds of soil and grows like a weed here in Houston. March 2013 A return visit to do maintenance. Everything is looking good! We installed a potted plant zone to water the pots. 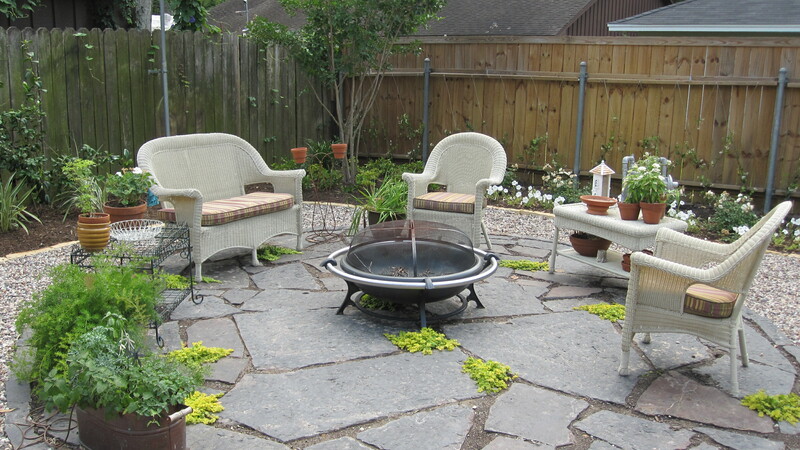 We used a blue gray flagstone cut into the soil for the patio and planted creeping Jenny in between the stone. We used a buff colored chop stone for the flower bed border. In between we used rainbow gravel. It is less upkeep than lawn and still lets the rain water percolate into the soil. I like the rounded multi-color marble sized rocks that are actually not too bad to walk on in bare feet. 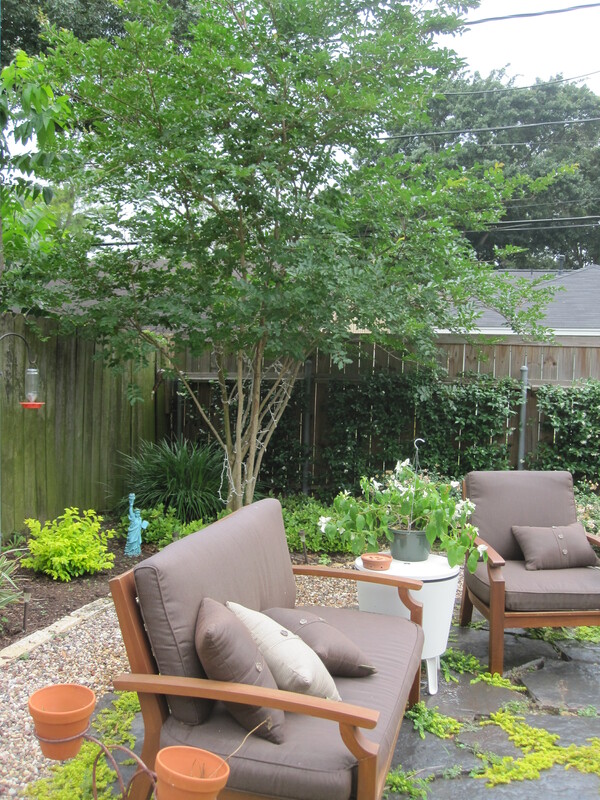 May 2014, the crape myrtle is filling out nicely after two years. They added some annuals to brighten up the space. And you see the new car hiding behind the screen. The vines didn’t make it through the winter and they are thinking to try another variety. Cedar grayed after a two years. It is not only a pleasure to visit gardens we have designed and installed, it is good for me as a designer to see how things are holding up. This garden was installed in the middle of our drought. We amended all the irrigation in the beds to drip and we put in plants that are both drought and frost tolerant. We have had to replace very few! BW, Thank you for the complement. 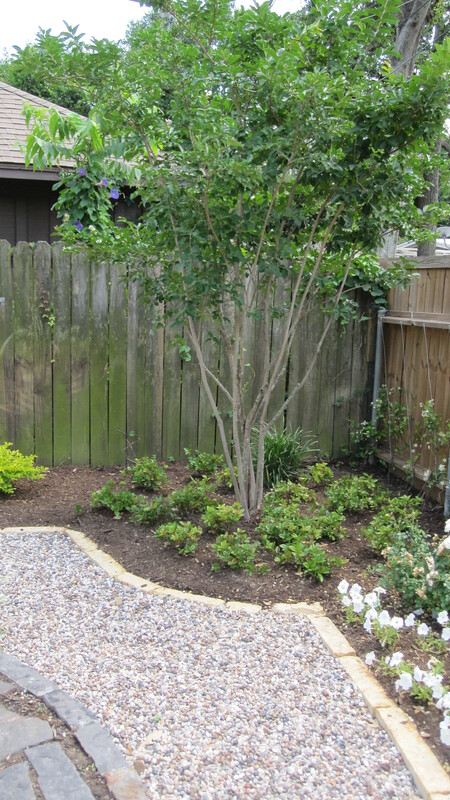 Crape Myrtles are great small to medium sized trees. And in Houston mid-summer when many things are done blooming the crape myrtles across the city come in to bloom in pink, white and purple, it is a nice change from all the green. A wonderful garden! I like the screen very much! Thank you Arthur : ) The screen really works doesn’t it! What a delightful transformation! 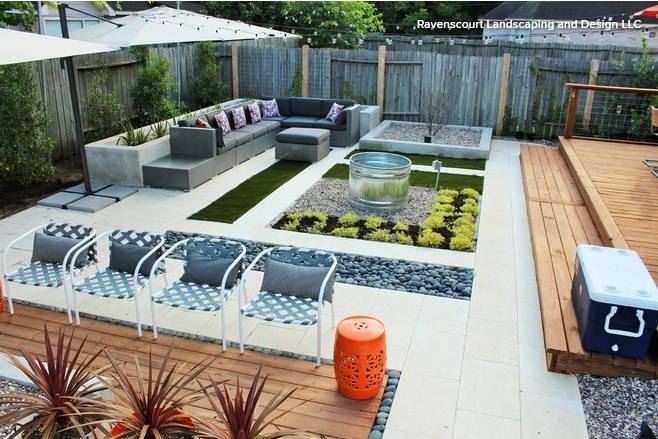 I like the screen and fountain, and the stone seating area with the gravel surround. 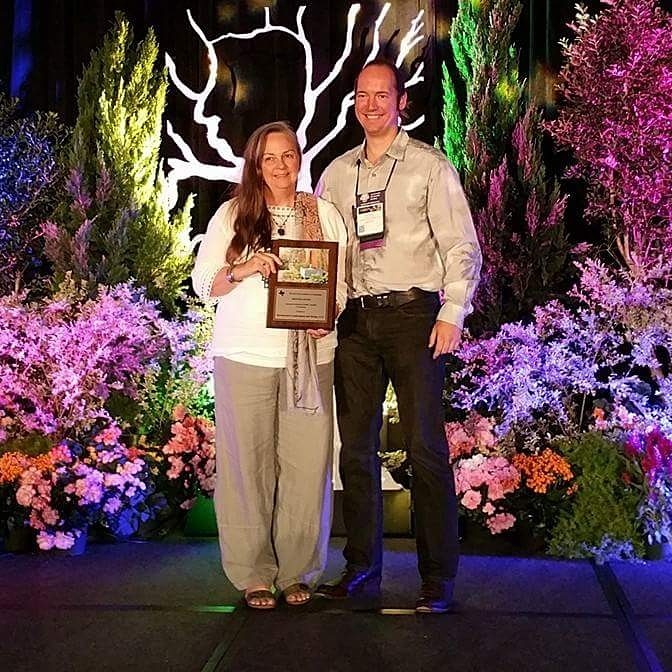 The Crepe Myrtle looks marvelous, I really miss them from when I lived in Houston. How deep does the gravel need to be to keep out weeds? 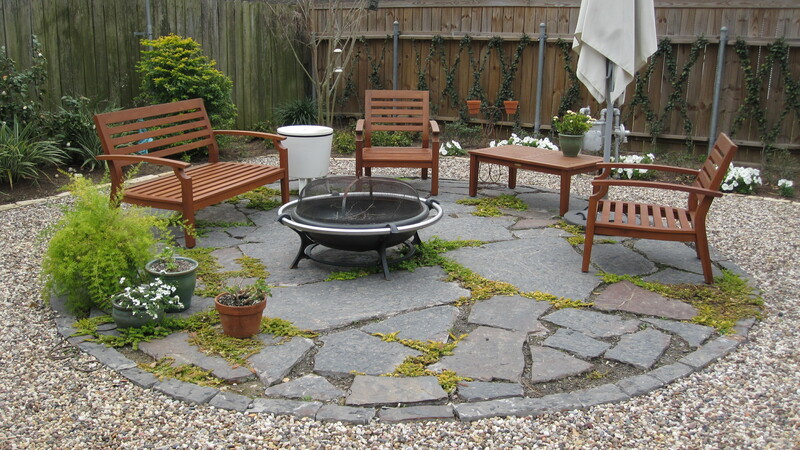 What a nice area it’s become, and I love the stone that was used for the seating area. It really became a well defined space with the circular edging. Love the screen too! Thank you Bittster! 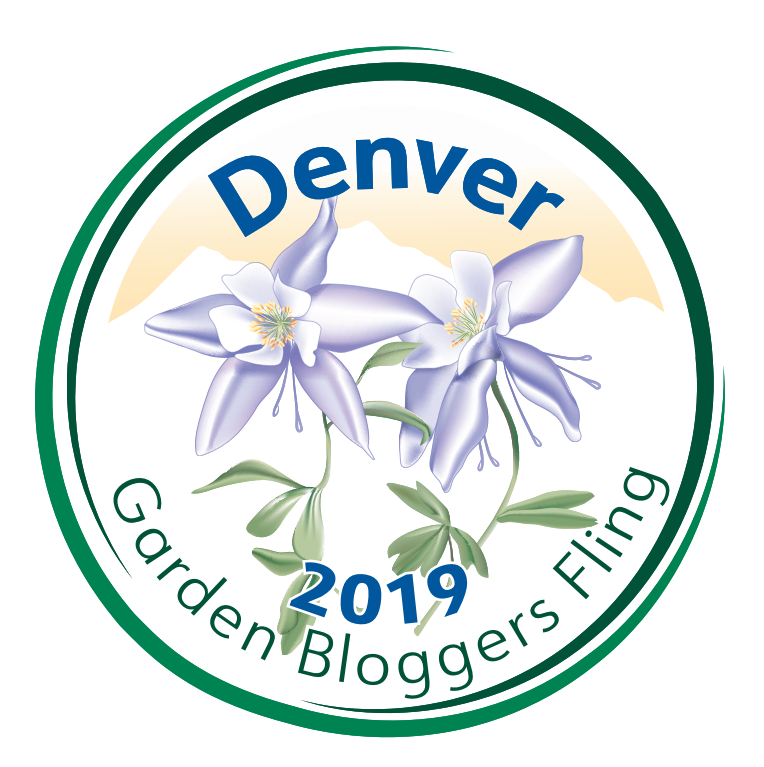 The blue gray flagstone is one of my favorites!